A family on the verge of a breakdown. Father Richard (Greg Kinnear) is desperately trying to sell his motivational success program ... with no success. Meanwhile, "pro-honesty" mom Sheryl (Toni Collette) lends support to her eccentric family, including her depressed brother (Steve Carell), fresh out of the hospital after being jilted by his lover. Then there are the younger Hoovers - the seven-year-old, would-be beauty queen Olive (Abigail Breslin) and Dwayne (Paul Dano), a Nietzsche-reading teen who has taken a vow of silence. Topping off the family is the foul-mouthed grandfather (Alan Arkin), whose outrageous behavior recently got him evicted from his retirement home. When Olive is invited to compete in the Little Miss Sunshine pageant in far-off California, the family piles into their rusted-out VW bus to rally behind her with riotously funny results. $370.782 thousand on 7 screens. A darkly comedic indie hit, 2006’s Little Miss Sunshine introduces us to the deeply dysfunctional Hoover family. Driven, success-obsessed Richard (Greg Kinnear) conducts not-too-popular self-help seminars, while Sheryl (Toni Collette) deals with her depressed and gay, suicidal brother Frank (Steve Carell). Grandpa Edwin (Alan Arkin) got kicked out of his retirement home and snorts drugs in the bathroom. Sullen, nihilistic teen Dwayne (Paul Dano) refuses to speak and literally counts the days until he can move out of the house, while chubby young Olive (Abigail Breslin) dreams of fame as a beauty pageant contestant. That issue prompts the movie’s main storyline. Olive wins a Little Miss Sunshine contest and this requires her to go to the next round in Southern California. Due to complications, the whole family gets stuck driving out from New Mexico in their old VW bus. Sunshine follows all their ups and downs through this process. If Wes Anderson remade National Lampoon’s Vacation, Sunshine would be the result. Whether that’s a good thing depends on your point of view. The flick casts a much darker tone than the Chevy Chase vehicle as it takes a tortured path in its view of the family unit. To be sure, the Hoovers are much more overtly dysfunctional than the Griswolds. The latter suffer from only minor issues, while the former are a total mess. What does it say when the suicidal one may be the biggest voice of reason? It says that Sunshine won’t be a traditional flick, though I don’t think the film is quite as off-kilter as it’d like us to believe. Despite the myriad of problems associated with all involved, the movie really hews pretty closely to the standard road trip storyline. When I compared it to Vacation, that wasn’t a joke. Both share quite a few similarities, from a father obsessed with making it to the final destination to… well, I won’t share the others since they’d offer potential spoilers. Suffice it to say that I see a lot of the same beats in both pictures. That also means both flicks are essentially episodic in nature, though Sunshine seems less oriented in that direction. Much of Vacation felt like a series of barely-connected comedy sketches, while the action in Sunshine meshes together in a more coherent, organic manner. Unfortunately, that action rarely becomes terribly interesting. Sunshine relies on characters to drive it forward but it doesn’t manage to develop the roles very well. Of all the main participants, only Richard goes through an actual arc. Others change in a variety of ways, but to describe these actions as “arcs” would be an overstatement. Granted, in reality, we shouldn’t expect much to happen to people in the course of a few days, but since the movie wants us to see character growth, I don’t think it’s irrational to feel disappointed by its absence. At least the very strong cast helps make the parts interesting. Arkin comes across especially well as the hedonistic grandpa. He makes Edwin a delightfully seedy character and avoids the usual cutesy “rappin’ grandma” traps normally thrust onto aged actors. He’s the most interesting member of the troupe. Unfortunately, all of the other characters remain pretty boring, so despite their best efforts, the actors can’t make much from them. I couldn’t help but think Sunshine would’ve fared better in the hands of another director. This was the feature film debut of married co-directors Jonathan Dayton and Valerie Faris, and while I don’t think their inexperience harmed them – indeed, they’ve directed videos and commercials for years – I just wonder if someone else like Wes Anderson could’ve made more from the material. As it stands, Sunshine is a sporadically amusing but ultimately lackluster flick. At its best, the movie offers a moderately entertaining study in character dynamics. Unfortunately, it just doesn’t have enough going for it to sustain attention over more than 100 minutes. 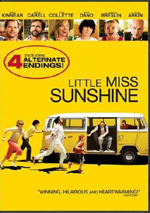 Little Miss Sunshine appears in both an aspect ratio of approximately 2.35:1 and in a fullscreen version on this double-sided, single-layered DVD; the widescreen image has been enhanced for 16X9 televisions. Only the letterboxed picture was reviewed for this article. An erratic transfer, this one came with a mix of ups and downs. Sharpness usually worked well. A few shots looked just a smidgen soft, but those were rare. The movie mostly remained reasonably concise and accurate. Jagged edges and shimmering created some distractions, and a little edge enhancement also occurred. As for source flaws, I noticed a few specks, and the flick seemed a bit grainier than usual. Colors were good. The movie exhibited solid tones that matched its visual design. Blacks seemed fine, while shadows were acceptable. Low-light shots could be a bit muddy, but they were adequate across the board. Though much of the flick looked pretty good, I thought the light debris and distracting jags/shimmering left this one in “C+” territory. Given the subject matter, I anticipated little from the Dolby Digital 5.1 soundtrack of Little Miss Sunshine, and the mix matched my expectations. The soundscape usually remained modest and focused on gentle environmental information. Not much activity emerged from this subdued piece, as it stayed with light ambience much of the time. A few scenes on the road added slight kick but not much. The surrounds lacked much involvement and never stood out as anything noticeable. Occasionally a vehicle moved to the rears, but most other utilization of the surrounds was very minor. Audio quality was positive. Speech seemed natural and crisp, with no edginess. Effects were clean and accurate, while music sounded smooth and concise. Low-end response was perfectly adequate. This was an acceptable mix for a low-key movie. A decent array of extras fills out the set. We find two separate audio commentaries. The first comes from directors Jonathan Dayton and Valerie Faris. Both sit together for this running, screen-specific piece. They discuss the project’s long path to the screen and changes from the original script, musical choices, locations, casting, characters and performances, challenges coming from the world of commercials and videos, their collaborative style, technical issues, and a mix of other production topics. At the outset, Faris describes herself as a reluctant commentator, but no negative attitude materializes. Indeed, this turns out to be a pretty solid little track. Faris and Dayton cover a lot of territory in a concise and informative manner. We find a nice overview of the production with little filler or spots that drag, so this becomes a decidedly useful discussion. For the second track, we get Dayton and Faris with screenwriter Michael Arndt. All three sit together for their running, screen-specific chat. Though we get a mix of notes about general production subjects, topics connected to characters, story and script dominate. Inevitably, some of these duplicate information from the first commentary, but even if they didn’t, I’d deem this track less satisfying than its predecessor. That’s mostly due to the discussion’s tone. While the directors’ commentary comes without a lot of praise and happy talk, this one compensates. No, it doesn’t suffer from a ridiculous excess of those laudatory elements, but those sorts of comments materialize a lot more often than I’d like, and they make the discussion less satisfying. On its own, this is actually a decent commentary, but it suffers by comparison to its predecessor. 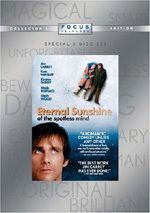 The commentaries accompany both widescreen and fullscreen versions of the film, but the other elements are side-exclusive. Side One features four Alternate Endings which fill a total of five minutes, nine seconds. The directors dislike the first so much that they won’t let us watch it with production audio; they provide commentary to discuss its problems. The other three scenes come closer to the spirit of the final flick’s conclusion, but they’re uniformly mediocre. We can watch all of these with or without commentary from Faris and Dayton. They chat about the different conclusions and let us know why they rejected them. The remarks help us understand the processes involved with producing the flick and its ending. Over on Side Two, we discover a music video for DeVotchKa’s “Till the End of Time”. Directed by “Dwayne Hoover”, the clip simply intercuts movie shots with lip-synch band performance. It’s a snoozer. In addition to a 30-second soundtrack spot, we get a collection of trailers. Unfortunately, we don’t find the ad for Sunshine. 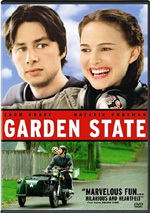 Instead, we get promos for Sideways, Garden State and The Illusionist. Occasionally entertaining but often somewhat dull, Little Miss Sunshine disappoints. I’d heard great things about the movie and wanted to like it, but beyond some good performances and a smattering of laughs, the film falls short of its goals. The DVD offers mediocre picture and audio along with some interesting extras highlighted by a pair of commentaries. Sunshine might merit a rental for fans of low-key indie comedy, but that’s the most I can recommend.